The monster $50 billion, 9.6 Gwe nuclear reactor deal announced last week between South Africa and Russia’s Rosatom, and which took the global industry by surprise, also apparently shook up the political establishment in Pretoria. Critics of the deal have popped up like summer range fires on the savannah, and among leadership figures in and out of the government. Almost all of them are unhappy with the “done deal” nature of last week’s announcement. 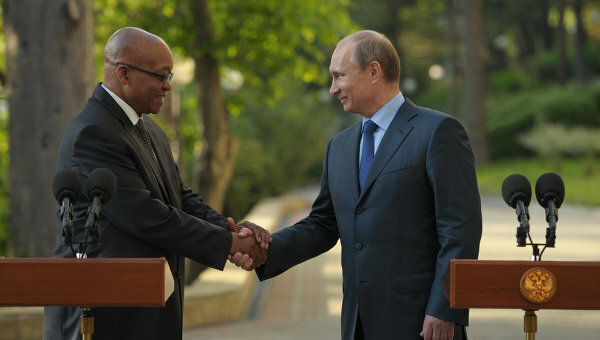 Adding to the heat directed at the deal, and to Zuma, is a report in the South African Mail & Guardian newspaper that asserts the agreement was personally negotiated by Zuma with Russian PM Putin at an energy conference held in Brazil last July and then signed off when Zuma traveled to Moscow a month later. It called for construction in South Africa of eight reactors with an installed capacity of 9.6 Gwe. Doing the math that comes to 1200 MW per unit. According to Rosatom, some, but not all. of the reactors would be online by 2030. Where the wheels start to come off in South Africa is that the Treasury Dept told an energy committee in Parliament this week it had no clue about the deal or how the country would pay for it. For its part, the Energy ministry told Parliament it was still working on a $27 billion energy package which, at $6500/Kw, would deliver four reactors. Finally, the ANC, Zuma’s home party and source of his political base, told the newspaper it had no idea there was an impending nuclear deal until Rosatom announced it. Terms of the agreement have come into view and four clauses reported by the Mail & Guardian have drawn critical attention. The clauses make very clear how subordinate South Africa is to Rosatom’s interests. There will be no technology transfer of Russian reactor design to South Africa. South Africa must do business with Rosatom exclusively for the next 20 years. Finally, South Africa must accept the Russian reactors at some point in the future and be liable for their safe operation as well as decommissioning. As is the case with all of its other global deals, Rosatom will supply the fuel for the reactors and take back the spent fuel over the entire life cycle of the reactors which would be for up to 60 years. The political battle Zuma now faces is getting South African electricity customers to pay for the power that will come from the reactors. While state owned nuclear utility Eskom would likely be the agent that would purchase the power from them, selling it would require significant rate increases and a major investment in power lines, substations, and related infrastructure. The South African government, as a matter of political policy, has kept Eskom teetering on financial collapse by refusing to authorize the rate increases its needs to solve the country’s perennial energy shortages. Worse for Zuma, the nuclear deal has generated strong opposition from the nation’s coal mining firms, and their workers, who had been counting on completion of a huge coal-fired power station. If the Russians get their way, the coal power station will never be completed as planned nor will the coal that would be mined for it ever taken out of the ground. Just 15 years of easy payments? It is unclear how much of the cost of building the reactors will be financed by Rosatom. There are precedents that could be the basis for the South African plan. In a deal announced September 23rd, the Russian firm said it would finance 49% of the cost of 2000 MW of a $10 billion nuclear power in Jordan. if it follows that model in South Africa, the country could be on the hook for half of $50 billion, or $25 billion, which it does not have else would have issued its own tender. Either way, the reactors come out at $5000/Kw which is $1500 less per Kw than the expected “overnight cost” estimated by South Africa’s Energy ministry. On the other hand, Russia could follow the model it is using in Turkey which is 100% financing, operating the reactors for 15 years while selling the power at guaranteed rates, and then offering the plants at auction to equity investors. The complexities of South African politics have produced a lot of posturing about the deal by various elected and appointed officials. In the end, Zuma’s real battle will be to convince the nation’s heavy industries, which want reliable power, that economic growth, and end to brownouts, can comes at an acceptable price for electricity from the Russian reactors. This entry was posted in Rosatom, Russia, South Africa and tagged Nuclear, Russia, South Africa. Bookmark the permalink. This is typical of “Big Man” rule. Typically the Big Man receives substantial grease and everyone else gets to pay the bill. Given the collapsing of the South African economy under “Black Economic Empowerment”, it’s questionable just how those plants would ever be paid for or if Russia would even be able to get payment for the first 15 years of electricity. But that’s Russia’s problem. I wonder where Russia plans to find all of the workers required to fulfill the commitments implied in the deals it is inking?